It's hard to ignore the project's underlying statement. Diced pears, instant cappucino powder, and "beverage based lemonade" may not sound like things you'd find on the menu at a world-renowned, fine dining establishment. That's because you wouldn't. They're military combat rations, or MRE (Meals Ready to Eat). Not too surprisingly, they're so universally abhorred that they've been nicknamed "meals rejected by everyone." But for Chuck George, Jimmy Pham, and food artist Henry Hargreaves, the MRE (Meals Ready to Eat) items provided to soldiers in the field of duty were the source of ample artistic inspiration. 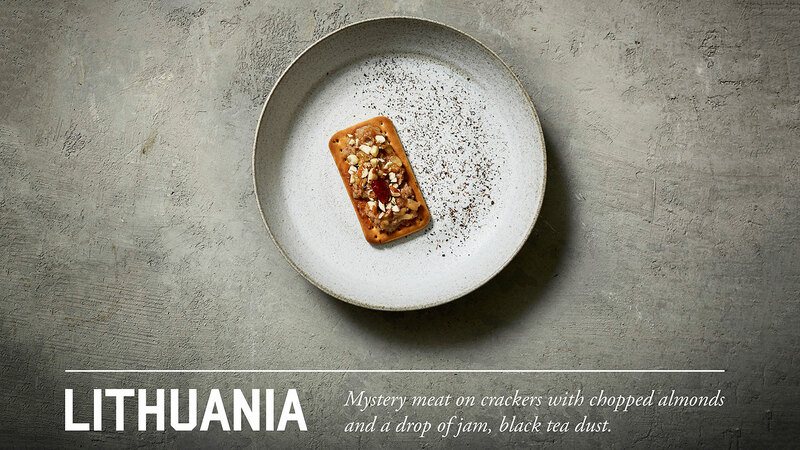 They decided to plate them, along with many other military food staples from countries around the world, as if they were being served at a Michelin-rated restauraunt...gorgeous ceramic plates and all. In a behind-the-scenes video, the artists are seen tearing open unsightly ration packets, pulling out everything from canned meat to powdered drinks. They then get to work slicing, dicing, and sautéeing the food before carefully plating it so that the food looks like it's of the highest quality, ready to be eaten by a diner at a fancy restaurant. Plain crackers and small cubes of cheddar are transformed into an impressive cheese board, and a plain-looking white sauce is drip-painted, Jackson Pollock style, across a black plate. This isn't Hargreave's first food art experiment. He's done Beatles food art (Jell-O Submarine, anyone? ), documented the food people are prepping for the apocalypse, the last meals of death row inmates, and even extracted iron from breakfast cereal. This one's particularly resonant, though, because he manages to highlight the irony of the fact that we give our most courageous citizens our most unappealing food. 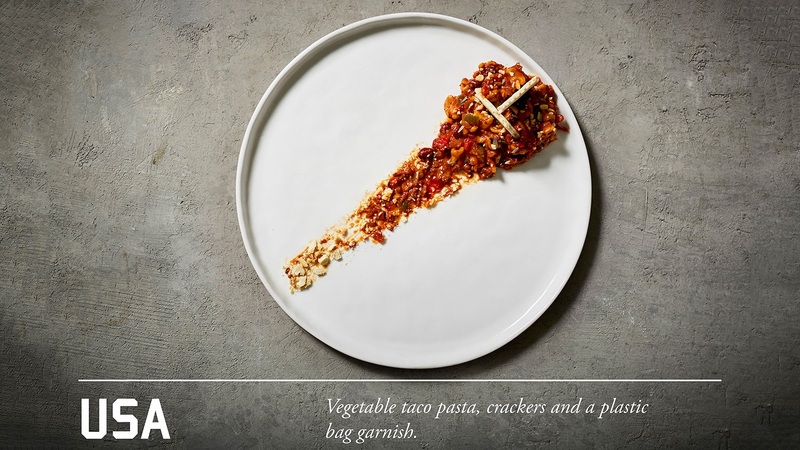 "With this project we wanted to reimagine the meals and plate in a manner of a Michelin starred meal," Hargreaves wrote in a statement. "In essence, taking the worst food, provided to the bravest people and visually elevate it as if it were being served in one of the world’s most revered restaurants."